These fish are so cute they match the sea turtle picture that are in sea grass also! I put these in the master bath and they are soooo cute! Thanks Overstock, I would definitely recommend these to my friends! 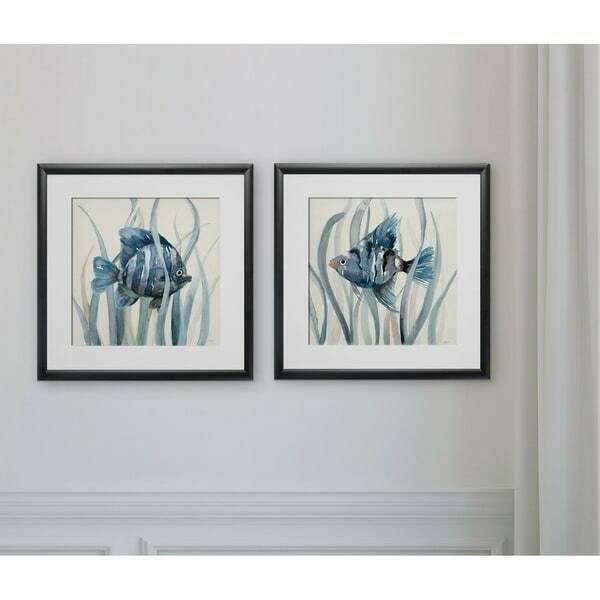 Fish in Seagrass I -2 Piece Set 2 Custom Framed Prints. 100% and created to last. Individually printed and framed by hand to very high standards. Printed and inspected one at a time utilizing the latest archival UltraChrome Giclee inks Consisting of 2 Total Framed Pieces Each measuring 16''x16'' x .75'' deep Each Piece is Individually Framed Acrylic Glass Each piece includes hanging accessories and is ready to hang. You need only to apply an anchor to the wall of your choice. The pictures themselves are really nice. However they seem to be very cheaply made. I am keeping them because the colors are very vibrant and match my decor.